Kill a pirate captain on her own ship. Travel to the Solitude harbor. Get onto Safia's Ship, the Red Wave. Report back to Nazir and claim your reward. 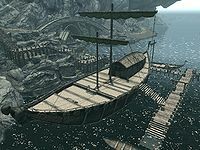 Fast-travel to the East Empire Company Warehouse (or Solitude if you haven't been there) and then board the ship the Red Wave. Even though boarding the ship is considered trespassing, the "guards" (crew members) will not actually confront you if they see you. All they will do is say "you're not supposed to be here" and then leave you alone. Safia can be found in the middle deck of the ship, walking around switching chairs every few minutes or eating. Note that two of the Red Wave's crew members are considered essential and thus cannot be killed and will continue fighting a little after you "defeat" them, which also gives you bounty. Therefore, it is best to avoid any combat with the crew. "I represent the Dark..." "The Dark Brotherhood? Yeah, yeah, yeah. You think this is the first contract I've had on my life? I'm a pirate, sweetie. Assassination attempts are an occupational hazard. Now, shall we?" "You face the Dread Lord..." "Sithis? Let me guess: "In the Void!" By the gods, you Dark Brotherhood are a predictable lot, aren't you? Okay, here's how this works. You try to assassinate me, and I kill you. Horribly. I have done this dance before, you know." Each dialogue option causes her to initiate combat, thus allowing you to kill her without gaining a bounty. Her crew will also fail to defend her if she initiates combat. After the kill, report back to Nazir for some leveled gold as a reward. This quest can conflict with the Thieves Guild quest The Dainty Sload. Since several members of the crew are essential - including the one for the aforementioned Thieves Guild quest - the fight can go badly, and a large bounty can be incurred. Sometimes after approaching Safia and talking to her, she will not turn hostile. 200 Finishes quest Safia is dead, and I have collected my reward from Nazir at the Sanctuary. On the PC, it is possible to use the console to advance through the quest by entering setstage DBSideContract12 stage, where stage is the number of the stage you wish to complete. It is not possible to un-complete (i.e. go back) quest stages, but it is possible to clear all stages of the quest using resetquest DBSideContract12. This page was last modified on 25 May 2018, at 03:04.